GMO corn or soy is not a treat (catch show #46 on the Low Tox Life podcast on the subject to see why). Food colourings that can alter brain function and may cause cancer are not treats. Meat glue and pink slime (ammonium hydroxide) in some commercial burgers are not treats. Trans fats are not treats, in fact they’re harmful. Aspartame, found to – in the end – CAUSE weight gain and be a possible carcinogen, is not a treat. So how on earth are the processed weirdness products treats? Isn’t it just weird when you slow your mind, be present and truly think about? Something I’ve come to realise over the years that just because something is considered ‘normal’ doesn’t mean it’s great. Originally ‘treats’ were real food, chemical free and as I said, the odd slice of cake, biscuit, burger or lolly wouldn’t hurt at all – because they all used to be made with real ingredients that we could find in our pantries. So while not the healthiest everyday options, the odd treat wouldn’t harm you. The problem is when we took this phrase “The odd treat won’t harm you” into the age of highly denatured foods such as vegetable oils, petroleum based colours, preservatives to make things last a year and fly around the world, car coolant to make ice cream not ice up and be easy to scoop… That is where we’ve gone wrong because these strange additions didn’t exist when “the odd treat won’t hurt” became a saying. 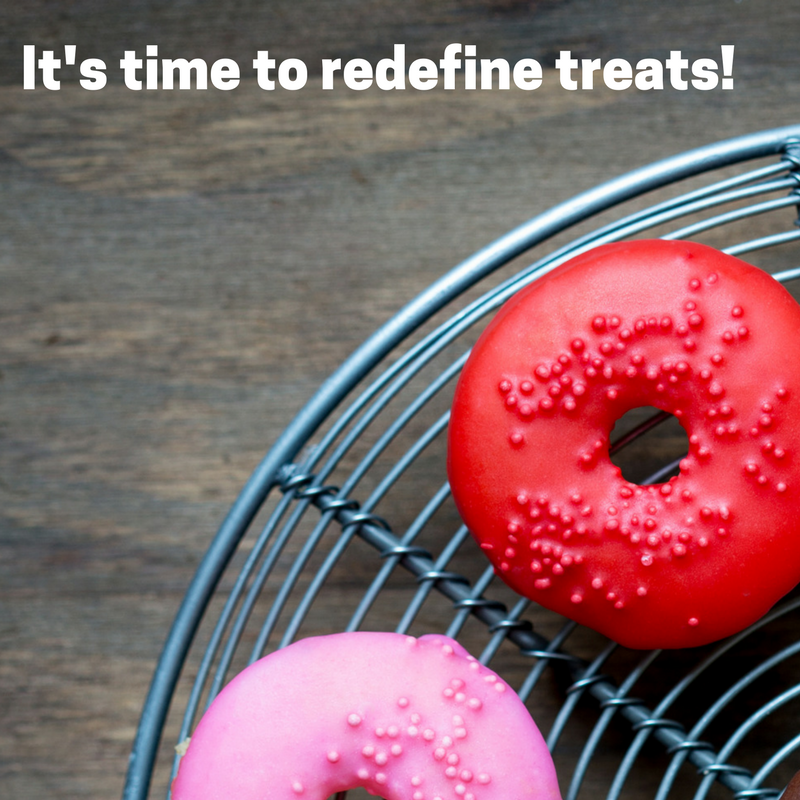 If treats have changed, they need to be reassessed by us in terms of safety. What if we worked on our definition and truly recognised so called ‘treats’ for what they really are – Nothing more than a money making farce! Once you’re firmly committed to Real Food, the treats are boundless, they just don’t happen to have big brand names. Home baked cookies, luscious cacao smoothies, cakes, tarts, home made ice pops treats – those are real treats. We can make recipes with gentle sweeteners, healthier flours, no flours at all… We are in control and we reap the rewards of a little time in the kitchen. Check out the “sweet treats” section on the blog here, under “recipes” – I have hundreds of treats for you there! The “treats” mindset needs to change. We need to stop calling marketed food-like products ‘treats’ and bring it back home. It’s just not a treat to give a kid a slushie with 11 teaspoons of high fructose corn syrup and a hyperactivity causing artificial colour in it. We’ve been told by marketers for decades about these treats and we’ve so totally bought into the brands. My favourite ‘treats’ over the years have been things such as Oreos, Microwaved popcorn, Curly Wurly’s, British Cadbury, Soya Crisps, Gatorade, Magnums, Soft serve, Ben and Jerry’s, McDonald’s Quarter Pounder… so if you think I’m preaching from a position of perfection, think again. If we’re really going to change our mindset and shape the world with our collective choices, then it’s never really a treat to have a chocolate bar with 12 additives our bodies don’t understand, is it? Make a super quick home made chocolate bar instead. SO good! The shift is a deep one. The need to explain to our kids is imminent. We need to have patience with them and ourselves, while we get it across the line with them that there’s bad stuff in all those ‘treats’ so “why don’t we make something yummy when we get home! ?” It’s not uncool if cool people start doing it, right? I’m assuming here of course that we’re cool? And then there’s the beauty of what cooking means – Cooking together, smelling something baking in the oven together, and eating something delicious together, as a treat. A real one. It also means we eat less sweet stuff in general, because we can’t gratuitously grab at it in an instant and on call. That then means a really good chance of weight loss, less ADHD, less allergies and reduced disease risks. Wow. Powerful stuff. Here’s to treats. Redefined. If this article struck a chord with you, then you might like my book, Real Treats, available from Amazon here. Give yourself a good year for this journey, if this scares you to death. Baby step it. Chunk it down. Join the community – we’re absolutely judgement free! Tiny changes over time will equal success and a deep understanding – possibly even boundless enthusiasm! It’s a mental shift in thinking NOT a willpower issue. I’d love to hear of your successes in implementing real treats, weaning yourselves or kids off the junky stuff et all. If you know people who struggle with this, please share. It’s not a goodbye to treats. It’s realising that most of that stuff isn’t a treat in the first place and adding delicious things into your life that are! GMO Reading. Apart from the devastation to soil quality and ecosystems, including the ever important yet dwindling bee population, that genetically modified seeds and pesticide spraying cause in agriculture, there is so much money and power that independent studies attempted to study effect on rats, often get retracted from medical / industrial pressure in the journals that dare publish them in the first place. Here’s a look at one such case. I don’t have the ultimate answer, but I just can’t see how genetically modified seeds made ‘ready’ for that same company’s pesticide, is right. All it sounds like to me is a clever business plan if you want to make lots of money. Find out what “pink slime” is and why Jamie Oliver campaigned against it, resulting in McDonalds removing it from their burger meat here. Aspartame is heavily contested. There’s plenty of ‘for’ and plenty of ‘against’. The official cancer associations will tell you there’s no cause for concern, but the alternative health world will. Given the way it’s produced and how chronically ill I personally used to be in my years as a diet c*&e drinker and eater of “sugar free” treats, I definitely have my doubts and choose a far simpler sweet route: Fruit, Home made chocolate in moderation, and the odd slice of delicious wholesome cake or biscuit. I much prefer to do this while they all battle it out on whether or not it’s harmful. Laney, You’re welcome & thanks so much for taking the time to say. I had the fortune of having my epiphany when lil’ guy was just starting solids, so he’s never known different. Me personally though having grown up considering those things to all be treats, it took me about 3 years to personally undo all the embedded ‘inner me’ language that made me choose stuff. It’s so fascinating to me as a subject. Love your blog /business by the way. Was at problogger and didn’t get the chance to come and say hi! Great post Alexx. Congrats on being an ambassador of Food Revolution. I’ve noticed big changes in my view of “treats” as I’ve gotten older. It used to be a chocolate bar, the occasional Quarter Pounder with fries, a tube of Pringles. Now as I realise my body really, really hates preservatives, I’ll go for a piece or two of 70% chocolate, triple cream brie on beautifully fresh sourdough, a fillet of crispy skin salmon [medium rare of course!] often with avocado on sourdough or with a white bean mash, an eye fillet, homemade guacamole and corn chips. And I feel so much better for it – on my tastebuds and my insides. I succumbed to the craving for a bag of cheezels last week and regretted it almost instantly. And for the next two days as my body processed the evil I had swallowed. What WAS I thinking!?! Thanks Mel. It’s our generation that was in the thick of growing up marketed to, isn’t it and it’s now a case of what we teach to the next, now that we know. It’s that simple. My lil’ guy of 3 thinks kale chips, gruyère, home made cakes and figs are treats and asks people if things have ‘numbers in them’ if offered something. I’m so inspired by his ability to take that on and understand it. You make me feel like going out there and buying a big wedge of BRIE!!! lol. Don’t be down on yourself about the cheezels. Those moments serve as reminders that you’ve made an awesome decision to move away! Have a fab weekend, Alexx. And I’m very impressed with your 3yo too!! He’ll have a you tube channel before too long. He’s hilarious. Other day he was making a pretend smoothie in the bath “Mummy, you know what this needs? A little touch of kale” True story. lol! Well said! For us treats are home-made icecream, bliss balls, brownies and the like! Great post Alexx, we blend smoothies at home using berries, honey and low joule cordial instead of pumping sugar-laden fruit juice into our kids. They love them! Thanks so much Sam and just love hearing about all these people doing real treats at home. Just watch for where the sweetness comes from with the cordial. Low joule can mean fake sweeteners, and I’d hate for you to think you’re doing something awesome and then find out not – like every woman and diet coke! lol. Sounds to me like you can phase it out anyhow and do berries and honey as the base – winning combination! Hope you’re well and 2013 has started out fab for you and yours, Alexx. Hi Alexx, great post. I agree wholeheartedly that ‘treat’ needs to be redefined especially for children. I have two sons age 3 and 6 and we bake our own dessert a couple of times a month and make ice cream from time to time. One of the difficulties I think many parents face is with grandparents and other relatives and friends who think that by not giving children sweets and processed food you are being mean or depriving them of ‘fun’. Spending time together and having a long healthy life is the sweetest treat more than any processed ‘treat’ could hope to be. So great to find your blog. Wow, powerful stuff. I so love your passion, Alexx! I’m feeling inspired to re-double my efforts with my family. I’ve been changing things slowly for Mr 6 as he has some sensory issues with food but he’s now onboard with the idea that Mummy’s job is to give him healthy food for a healthy body and a healthy mind. I think we could all do with finding other ways to treat ourselves than always with food too (coming from a long time comfort eater!!). Thank you so much for this post. I have a 9 and 6 year old and our school district has just published an “acceptable” food list for Moms to use for birthdays and parties during the school year. It is full of junk, all homemade items are BANNED. There were some “healthy” options, carrot sticks etc oh and “GOGURT” as if that were healthy…. (no mention of organic either), but mostly just chemicals and junk… oreos, donuts…. etc. This was done to help the kids with nut allergies so I can understand the concern, however when I suggested that we replace birthday celebrations with 10 extra minutes of recess the other Moms insisted that their kids would really miss the treats. In addition to birthday celebrations there are also parties during the year generally about 25-30 opportunities to consume junk during the school year which is 180 days. My children are strict Paleo, and I am autoimmune protocol Paleo so I always pack their “treats” (there is almost nothing on the “acceptable” list that I would allow my children to consume) but it works out to “treating” the kids nearly once a week which doesn’t seem like a special occasion to me. I’m considering posting this article on the Moms school facebook page, but I’m worried it won’t seem very diplomatic (people generally think I’m crazy for not eating grains, etc) I’d love to hear If you have any ideas how I could bring some change to my school. Thank you so much for all the information!! Read ” Sweet Poison ” by author David Gilespi. The truth about sugar and processes ‘foods’…. Fantastic post Alexx. I’m going through ‘the change’ (ha!) with my family at the moment – have been doing the baby steps for about a year now but still have a long way to go. My biggest struggle is with the kids, especially my 6yo ASD son, when they go to friend’s birthday parties or school fairs, family events, etc, and they want to eat what all the other kids are eating. It’s hard to insist on them eating only the food that I have brought and not be tempted by all the colourful lollies and cakes filled with nasties. I know I’m not alone in this – I hear it from other mums all the time. But I will continue to push because it is in the best interests of my babes, and nothing is more important to me than their health and wellbeing. Thank you for your blog – it is inspiring and motivating and a big help to me! My daughter was raised strictly paleo for the first 2 years. Now we are a bit more relaxed but still whole food focused. I’m interested in the mind connection to ‘treats’ such as emotional eating. I don’t like saying ‘let’s have a treat” or using food as a reward/bribe. They just tend to slip into our day from time to time without much fanfare but I’m interested in what’ verbal’ approach you take with treats? I also don’t ban any food at parties, we do discuss what might be there and how she might feel /behave after eating them but at 4yo the choice is hers. I know she isn’t mature enough to say no yet but hoping this approach may benefit us longer term. She actually doesn’t like many processed foods and will take a bite then leave them but anything sweet she enjoys. She knows about balance and needing healthy choices but I’m still not happy with how she can sometimes perceive something sweet as a reward(?) for eating healthy. Your insight would be appreciated.